Dr Alex Pryor is a Palaeolithic archaeologist who joined the University of Exeter in September 2017. Dr Pryor’s main research focus is the application of isotope analysis to human and animal remains to investigate the subsistence practices that enabled our hunter-gatherer ancestors to thrive in seasonally changing environments around the globe, but especially in cold northern climates. Topics of particular interest include the reconstruction of diet, climatic context, and the mobility patterns of humans and their prey. A secondary specialism is the study of charred plant remains. His previous research has included projects investigating Palaeolithic food storage, the Palaeolithic consumption and processing of starchy plant foods, and the reconstruction of temperature changes associated with Dansgaard-Oeschger rapid climate fluctuations of the last ice age. 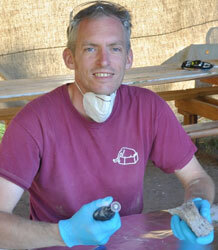 He is currently involved in research at Palaeolithic sites in central and eastern Europe. Prior to arriving in Exeter he studied and worked at the University of Cambridge (2003-2014) and the University of Southampton (2014-2017). Details for specific research projects are listed below. Alex is collaborating in this five-year international project funded by the Polish National Science Centre and run by Dr Jarosław Wilczyński of the Institute of Systematics and Evolution of Animals in Krakow, Poland. In the latter half (approx. 24,000-20,000ya) of the Gravettian period in Central Europe, evidence for the widespread Pavlovian technocultural complex that had persisted in the region for several thousand years vanished as this social system apparently collapsed, probably due in part to the increasingly severe climates associated with the last ice age. Lithic evidence from central Europe suggests a fragmentation of groups into discrete sub-cultures with minimal interaction between them. However another possibility is that hunters adapted to the harsher climates by diversifying their activities seasonally, making different tools in each season of the year while engaging in long-distance travel between regions seasonally to hunt different animals at different times of the year. Before joining Exeter Alex worked as a post-doctoral researcher for three years at the University of Southampton on a Leverhulme Funded project searching for evidence of food storage technology in the European Upper Palaeolithic. Food storage is postulated as an important adaptation developed by our hunter-gatherer (Homo sapiens) ancestors in response to the pressures of the last ice age, between 50,000-20,000 years ago. However, this theory relies on ambiguous archaeological evidence that is inherently problematic to interpret. Focusing on key archaeological case study assemblages at Dolní Vĕstonice-Pavlov (Czech Republic) and Kostenki 11 (Russian Federation), our goal was to search for food storage behaviours by demonstrating substantive human occupation of a campsite during a season of the year when none of the major prey species was actively being hunted and killed. Our method engaged in an intensive reconstruction of seasonal prey availability and seasonal hunting activities at the case study sites involving 1) the reconstruction of prey seasonal mobility using oxygen and strontium isotope analysis of faunal remains; 2) identifying the seasonality of hunting activities using dental cementum analysis; and 3) investigating firewood gathering practices based on the charred remains of the fuel consumed. While the formal data gathering part of the project has now ended, the analytical and publication phase is expected to continue for another few years. Kostenki village is located approximately 500km south of Moscow on the River Don. The area is famous for the large number of Palaeolithic sites discovered in the immediate vicinity of the village, all dating to the Upper Palaeolithic period between approximately 50,000-18,000 years ago. Many of these sites show evidence for multiple levels of occupation, meaning over 50 individual Palaeolithic occupation deposits are known within an area of a few square kilometres. One of these sites, Kostenki 11, is known for the spectacular examples of circular mammoth bone structures discovered there, usually interpreted as the remains of large Palaeolithic houses. In 2014 survey work revealed a new, previously undiscovered circular structure made of mammoth bone ‘dwelling’ complete with pits around the outer edge. Excavation work started later that year and is presently on-going. Working in collaboration with the museum director Alexander Dudin and other local partners, Alex has visited the excavations in 2015 and 2017 to undertake a program of isotopic study of the woolly mammoth remains, and a program of flotation for the recovery of charred plant remains from the site. These samples are contributing towards Alex’s research into both Palaeolithic food storage, and understanding the role of the woolly mammoth in Palaeolithic subsistence strategies. Alex was awarded his PhD by the University of Cambridge in 2011 for research investigating the impact of the Dansgaard-Oeschger climatic cycles on Palaeolithic inland continental hunter-gatherers of central and eastern Europe. He then worked in Cambridge as a research assistant on various projects before moving to the University of Southampton for a Leverhulme-funded post-doctoral research position in 2014. Alex joined the University of Exeter at Lecturer in Prehistoric Archaeology in September 2017.